I recently sat down and interviewed Voja Mitrovic for several hours about his experiences as a printer. Several important concepts emerged from this interview. He indicated to me that the three most important things involved in being a great printer are patience, developing a good dialogue and communication with the photographer he is printing for, and knowing how to read a negative. It is most important to know the photographer, to know what he or she wants, and to be able to read the image—like photographers, some people see things, and others don't! Great printing involves knowing how to choose the right paper, having technical skills, and a strong artistic and aesthetic sense. He feels that it has helped him very much to have been himself a photographer, in order to understand the goal of a photograph. Voja gives credit to Josef Koudelka for having helped him become as great a printer as he is. This is because of how demanding and exigent Koudelka has been in what he wants from a print. Koudelka’s prints are very different than Henri Cartier-Bresson's. Cartier-Bresson’s prints are very low contrast with many details in the highlights and shadows—H.C.-B. liked the tonal values of his prints to be like the "color of the Loire River." Gray, but a very detailed gray. Also, Cartier-Bresson’s negatives were, overall, extremely well developed by Picto over the years and in general very consistent. Voya says an exception to this consistency was his early work in Mexico and India, which are among the most difficult of his negatives to print. Koudelka, on the other hand, has demanded prints with relatively high contrast, and yet with detail in both the extreme highlights and in the shadows. On top of this, the development of his negatives in the early years was often very irregular, and the film he used while he was living in Czechoslovakia, before going into exile in 1968, was often cinema stock and very high in contrast. The highlights often become very blocked up. In many of Koudelka’s negatives the tonal range between highlights and shadows are extreme, requiring tremendous "maquillage," or burning and dodging, to achieve contrast and detail to his liking. Voya says that Koudelka’s prints have been 10 to 100 times more difficult to make than H.C.-B.'s. He recalls that at one point, after Koudelka first began to bring his work to Picto, Pierre Gassmann (that’s me with Pierre in 1995, at right) specifically designated Voja to print his photographs, knowing that he would have the physical and mental courage to meet the rigorous and precise standards of Koudelka’s printing demands. He feels that he and Koudelka understand each other well because of their common origins from Central Europe. He is very proud of their friendship. He indicates though that they have an understanding between them that their friendship and his printing are two very separate moments in time—the first always warm, but, while printing, the atmosphere is always one of clear minded, very demanding rigor. Voja recalls how Koudelka’s respect and confidence in his work was once solidified when he showed Josef a print and Koudelka was very satisfied, but Voja said that he was going to start over, because he knew he could take the process further and pull more out of the negative. This is a domain where Voja prints are exceptional—few people know how to pull as much out of a negative as Voja, and few would have also the physical, mental, and emotional courage and determination to do it. Voja Mitrovic and Josef Koudelka at Magnum, Paris, when John Morris was awarded the French Legion of Honor, 2009. Photo by Peter Turnley. Voja is very proud of the relationships and friendships that he has developed with the photographers he has worked with. These relationships have also offered one of life’s most important gifts—the opportunity to travel. He had been invited by photographers, as thanks for his work, to New York, Mexico, Rome, Barcelona, Crete, China, Cuba, and Barcelona. He is very proud to be among the first printers to be credited by name for his role in printing the photographs in books of photography and exhibitions. This had almost never happened before the early 1990s when photographers began to credit Voja in their books and exhibitions for his printing. The list of books and books for which he has been credited is astonishing. It includes almost all of the books and exhibitions of H.C.-B. since 1966, including Vive La France, Henri Cartier-Bresson in India, America in Passing, Henri Cartier-Bresson: Photographer, Mexican Notebooks, and Paris a Vue D’Oeil. He has printed the exhibitions and books of Josef Koudelka for Exiles, Triangle Noir, Koudelka, and Chaos. He has printed both the books and exhibitions of many others’ work, including all of my books and the exhibition and signed collector prints of my photographs. The book I did with my brother David of our early work, one of many for which Voja made the master prints. Voja has said that my cover picture here is his favorite picture of mine. Anyone who has taken my Paris Street Photography workshop has been treated to an amazing presentation by Voja. My guess is those lucky few to have witnessed one of his talks will never forget seeing the demonstration Voja makes of showing a sheet of photographic paper of a H.C.-B., Koudelka, Burri, or Turnley "straight" print, exposed only once with no burning and dodging, held up next to a final print showing all of Voja's artisanry. It is a phenomenal sight to see—and a powerful indication of the degree to which a great printer like Voja has contributed immensely to the expression of the vision of the photographer. I have witnessed Voja many times spend at least one hour of physical burning and dodging of a print. I've also seen him be able to repeat perfectly, like a machine, the exact same gestures and make a series of ten identical prints from the same difficult negative. While Voja has indicated that Koudelka’s prints have been the most difficult for him to make, there are several famous images of H.C.-B. which require tremendous burning and dodging—such as the image of the nuns praying in India. Koudelka’s image of the man and the horse and one of a street scene of a man setting off a fireworks rocket are among those of Koudelka's that Voja has commented are among the most difficult to print. It is hard to imagine the physical and mental stamina and courage required to be a great printer. You are in the dark with very low light for at least eight hours a day, exposed to the odors and effects of rather strong chemicals. I recall the feeling of walking out of Picto after a long days work, and being suddenly exposed to the late rays of an afternoon summer day, literally feeling off-balance from the physical impact of such a sudden change in environment. I have rarely met anyone who appreciates his annual summer vacation like Voja. He loves to lie on the beach and soak up the sun—which seems to rejuvenate his body after spending so much of the year inside without much light. Voja is a tall and athletic man always in great shape. I'm sure this has been extremely helpful in his work, which is not only mentally but also physically extremely demanding. You should try to stand under an enlarger with your hands lifted in the air burning and dodging with methodic consistency for one hour for only one print—and then repeat that some times ten times in a day. Each weekend, since coming to Paris in 1964, Voja played on a soccer team on Sunday mornings. He tells me that this enabled him to unwind from a week of stress and revitalize himself for another week of work ahead. He has also always been a wonderful family man, with a wife and two children, and he has a strong appreciation for good food. While I was at Picto, it was always impressive to see the regularity in which Voja would arrive each morning exactly on time, impeccably dressed, and then change in to his work clothes and begin printing. Each day at exactly noon he changed back into his street clothes, and, looking like a handsome movie star, struck out into the Montparnasse neighborhood of Paris for his daily ritual of a very good lunch. At the end of the day, at 5 p.m. sharp, he stopped work, and would go to meet his friends at the Café Cosmos for a bit of conversation before heading home for dinner. Finally, anyone who has ever met Voja, has been certainly struck by several rare characteristics. He is one of the most elegant, truly dignified people one will ever meet. He exudes a rare unpretentious dignity of someone that has led a hard working, decent life, and has cared for his family and friends, and put his heart completely into doing his work as well as he can. His spirit is infinitely fair and generous—when asked who is his favorite photographer, he will always refuse to answer, preferring to indicate the favorite image of each photographer for whom he has printed. He cites "La Rue Mouffetard" and "Matisse with pigeons" as his favorite H.C.-B. images. The man with horse is his favorite image of Koudelka, the image of Che Guevara and the cigar, his favorite of Rene Burri's, and my cover image from McClellan Street seen above is his favorite image of mine. While he has printed for so many great photographers, there are a few he wishes he could have printed for—Robert Frank, Alvarez-Bravo, and Irving Penn. He chuckled as he told me he had recently visited a Robert Frank exhibition in Paris and thought it could have been printed better. It is likely that with the change of technology towards an all-digital world, that the world will never again know many traditional black-and-white printers like Voja. He worries that all of the technological know-how in the world will not replace what it first means to know how to make a photograph, and then to know how to read a negative and interpret it. There have been already few traditional printers that could do it as well as he could. 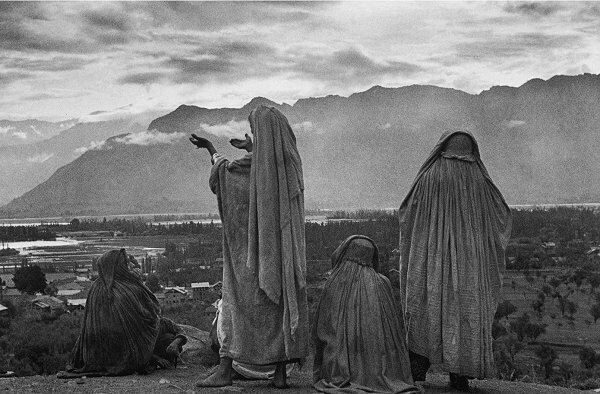 He recounts how Josef Koudelka has spent in recent years more than six hours with a digital printing technician trying to achieve a match with the subtle artistic expression of tones and detail in one of his prints. He also worries about how long good traditional silver printing paper will continue to be made and laments how expensive it has become. Voja Mitrovic, Paris, 1993. Photo by Peter Turnley. I have met with Voja for coffee almost every Sunday morning I’ve been in Paris for the past twenty years. Each time I leave our encounters, my heart is uplifted—I am reminded of what seems important to me—and I feel proud that I have chosen a way of life and a medium of storytelling that has enabled me to know and work with a person with his elegance, dignity, strength, and decency. And, I am sure that I would be only one among a list of photographers who would say that he has been one of the best and kindest friends one could ever ask for. The world of photography has been lucky to have Voja, and all of the other great printers that have meant so much to the powerful expression of moments photographers have chosen to share with themselves and others for now, and for posterity. He has spent his life in the dark, but he has helped illuminate the life and expression of so many. Thank you Voja. Please send this post to a friend! Featured Comment by Stan B.: "'...but few would have also the physical, mental, and emotional courage and determination to do it.' Yeah, I definitely came up short on that end, despite all the blood, sweat and tears I still managed to shed in the dark. But to be blessed as a so called 'natural,' I guess that's where the 'joy' of the darkroom really came in. For many of us it remained a war...."
Mike responds: Stan, I always used to say, "sometimes you win, sometimes the darkroom wins." Voya's comments about patience and equilibrium and just treating it as a job to be done—stoicism, he's describing—really resonated with me. Featured Comment by Jim Richardson:"Having done a little bit of printing for a couple of decades, the phrase that really rang out, Peter, was citing how Voja could repeat the same 'gesture' consistently. "Those who have never printed under an enlarger may not know what this means. But once you see someone dodging and burning a print, once you see the ballet-like gestures of the hands in the light of the enlarger, precisely casting shafts of light onto the paper through hands formed into narrow apertures, deftly changing the shape of those openings through the course of the burning, gently moving the light to the edge of the paper to add edge burn (and thus create a glowing center), burning with one hand while dodging with the other, all the while keeping a running count of each adjustment so that it can be repeated (and adjusted), then you understand why one printer can be so much better than another, just as one pole vaulter can make it over the bar, and another can't. It's that physically demanding. "All of this requires 'gesture,' as you point out Peter, and not everyone has that level of subtle grace in their movements. Thanks for bringing this story to light and thanks for reminding me of beauty of craft seen only in the light of an enlarger, where hands shape light as gracefully as a nuanced ballet." Featured Comment by V.I. Voltz: "Someone asked whether Voja printed the originals for Salgado's book Africa [now out of print and rising in price—don't say I didn't warn you! —Ed.]. At least some of those were printed by Nathalie Loparelli. the negatives were in her darkroom when she did some work for me years ago. "Which is also the amazing thing about Voja. The first time I was in Paris in 1995 I was 20 and thought I was good. So I walked to Picto, explained that I didn't speak French, but that I wanted some printing done and that I would like to speak to the printer, who, it turns out, was Voja. I had no idea who he was. He took me completely seriously, even though I am sure he could tell I was a total hack, and later commented that he liked one of my photos. Voja, of course, did an _i_n_c_r_e_d_i_b_l_e_ job of printing them. They sparkle and practically jump out of the paper at you. With those prints I managed to talk my way into a job that I had on and off through the next four years. "In 1995 if you'd told me the next print that Voja would make after mine would be a Cartier-Bresson or a Koudelka, I'd have thought I was good. Knowing what I do now, I'm just astounded at Voja's understanding, accommodating approach and sheer professionalism." Featured Comment by Jay Colton: "Thanks Peter. I have seen the craftsmanship in Voja's work. Being a fair printer myself, I greatly appreciate his craftsmanship and share in his lamentations. Silver printing is now made more difficult as the papers are disappearing. I print on Oriental Seagull but I miss the graded paper; the G is O.K. but I for one am not a fan of multigrades. In addition the chemistry is harder and more expensive. Thank God for Photographers Formulary. "On many occasions, I have explained in detail how I print only to see someone follow the letter and not the spirit of instruction. I understand it takes a kindred spirit to really craft a print. A printer must look into the negative and see your soul. As a photographer your negatives capture the moment but a great print recreates the moment in its own special poetry. If I don't print the image myself I have found it takes years (or a kindred spirit who sees through my negatives into my soul) to develop a relationship with a printer who knows what you want out of the negative and into your print. Silver prints are like little jewels that contain their own special reality. When we shoot in B&W it is not a 'true' depiction of the world; it is an allegorical fantasy in shades of gray where form elocutes a special magic. "The mastery of printing like any craft requires dedication. It s only after a great deal of time (Malcolm Gladwell quantifies it as 10,000 hours) that a true mastery is possible; where the intuition is innate and the gesture (as you put it so eloquently) poetic. Alas I have not put in the necessary time but I do so admire those whose craft has become natural like breathing. Like any artist they make it seem effortless (and it is, for them) and free. "I most enjoyed your relating his ethic that it is just work, no more or less. That honesty is the mark of a master craftsman the humble beauty of work unencumbered by artifice. Thank you for relating the little-known story of the invisible hands that great photographers trusted their precious images to. It is truly sad to see the last craftsman (both shooters of film and the master printers) slowly fade into the dustbins of history The world is poorer and a little darker without them. I only regret that I did not have the honor of having him print my own images." It's fascinating to see how the different status of image and word is reflected in this business of how rarely the custom printer has been credited in books. The Turnley's acknowledgement to Voja appears in the middle of their Acknowledgements, in the same paragraph with John Morris, both after acknowledging about a dozen friends in the editing and publications cycle. Koudelka doesn't acknowledge his printer in the Aperture edition of "Koudelka" that I checked, and there is no mention of Voja in the American translation of "Vive la France" which I have, although the print quality is lovely, not what you would expect for a Readers Digest-sponsored project. Vive la France and Koudelka, however, contain half a dozen essays, and acknowledge a small army of editors who have helped to shape the words that appear in them. Following from your first post, there are two things that I can immediately think of. Firstly: This man is clearly brilliant in his art and also extremely humble. The second part of your post here gives thanks as much as it does explain how his talent and his temperament has combined to make him so. Thank you Peter, and thank you Mike. Mike, Thanks so much for this. Reading about Voja reminds me of the famous story about Johann Sebastian Bach - someone asked him how he was such a brilliant organist, and he replied "I have ten fingers and 2 feet, the same as everyone else!" More to the point, I'm heartened to hear that so many of the great photographers produced the odd negative which was difficult to work with - I always had it in my head that they pretty well nailed it every time. Maybe I ain't so bad after all! It is very difficult to make meaningful comments on a story like this one. One wishes to say something, to let Peter know how very much we appreciate his sharing the story of Voja. But...it becomes an exercise in finding something intelligent to say in response to a great story. So I will not try to find a brilliant insight. But I do want Peter to know how moving it is to know the story of someone who is so very excellent at what he does and who he is. Thank you. Wonderful article and a great escape from all the talk about digital this and digital that. Thanks a lot! And I would love to once see a comparison of a "straight" print and the final print of a well-known and famous photo. If you (Mike) could manage to show us such an example here (perhaps via Peter and Voja) that would truly be a coup. Thank you so much for bringing Vojo's work out of the darkroom. I do a lot of my own printing, but have also worked with a printer for larger prints, and the relationship has been invaluable. He's raised the level of my own printing, which seems to have the effect of raising the level of my own picture making. I really appreciate hearing that such famous photographers have found similarly satisfying relationships with folks who can do some real magic in the darkroom. And it's good to know that even HCB has a few hard negs to print, and I'm not the only one who has had a few epic battles in the darkroom! Thank you for this two part story. It's wonderful to hear about Voja. It just won´t mean the same in thirty years time when we read perhaps on TOP "the untold story of one of the greatest digital printing technicians," and how someone witnessed how he was able to spend at least an hour making adjustment layers burning and dodging a print. Great stories like this one, keep proving how we are slowly losing essential parts of why many of us picked up a camera, this post brought back memories like the first time I saw a Salgado print, an Avedon portrait, Edward Weston´s portrait of Frida Kahlo or at school with my first ever B/W print of my ex-girlfriend coming up in the tray. There is no doubt that the image is what counts in the end, but lately I've been going on those lovely old twisty back roads with their potholes, instead of the interstate highway which digital seems to reminds me of. I´m enjoying all the screw-ups and uncertainty which comes implicit with film, it's a challenge which my 1Ds II and Photoshop just don´t inspire with at the moment. It´s fun also watching my four year old son run up to my Fuji 6x7 looking for a preview screen! Mike, did Voja print the originals for Salgado's book on Africa you were so impressed with? Peter, what a fine homage to this most gifted artist. It’s a real pleasure to have you share your experiences and affections for this man. Thanks for this essay, it’s most inspiring. Thanks for this piece Peter - a great tribute. Is there any place to see some of those straight print vs. Voja prints? It would be fascinating to be able to see the transformation? This is one of the finest and best written essays I've had the pleasure of reading. Well done. I will be thinking about this for days. Thank you for a wonderful account of a wonderful human being. I haven't read anything as engaging or as insightful as this for a long time. I concur wholeheartedly with what others have iterated, that a book or a DVD on Mr.Voja and his work would be such a joy to delve into. Invaluable. Thanks, Mr. Turnley, for the elegantly written and insightful review of this man's life as a printer. It made me wish I knew him. It also refreshed my enthusiasm for silver printing, which, one hopes, will never become a lost art. Rare and fugitive, but never quite lost. If we take your Paris seminar, would we get to meet him? "He exudes a rare unpretentious dignity of someone that has led a hard working, decent life, and has cared for his family and friends, and put his heart completely into doing his work as well as he can". I think this article is also, among other things, a touching gesture of friendship. Thanks again to Peter and Mike. Peter: Having met Voja when I took your Paris class for the first time, I never tire of hearing what this master has contributed to the photographic arts. And I share Voja's concerns about the future of traditional printing: the lab I use just announced that they have dropped wet printing in favor of making chromira prints from black and white negs. Horrors! Voja's story is an antidote to world tipping steeply toward mediocrity; maybe it will inspire others to keep his craft alive. Thank you for posting this story. I would likely not have learned about Mr. Mitrovic otherwise. An important figure in photography, and an artist in his own right. Makes me wonder, has anyone ever collaborated with him to create dual-authored original works? I mean works where Mr. Mitrovic isn't primarily trying to bring forth the other's artistic vision, but where the two together are each adding their visions and ideas to create a piece. It seems a natural and exciting thing to try. There could be many ways such a collaboration might work, including some that don't start with the photograph (or perhaps ever use a photograph, exactly). Simply wonderful. Thank you Peter for this heartfelt homage and thank you Mike for generously sharing your space with other gifted writers. Not that I would ever compare myself with Voja Mitrovic, but reading about him here brings me back to my last darkroom days; the early 1990s, when I was studying photography in the Fine Arts faculty of Concordia University in Montreal. I was working full time at a desk job and was studying part time for my own enrichment -- I never really thought about photography as a profession, mostly because I feared getting stuck doing weddings and cheesy portraits. Anyway, I had already been printing for eight or nine years, but at Concordia I was introduced to higher standards and through my studies I felt a need to go way beyond the basics. So I learned through practice. Lots of practice. 40 hours a week at my desk, two nights a week in class, and at least one night plus all day Saturday in the darkroom. Week after week, for more than two years. When I was working on exhibition prints, it was normal to spend two to three hours on each one. I knew I was getting close when a teacher looked at a 16x20 from a 35mm negative and asked if I'd shot it on a 4x5. I entertained the idea of perfecting the craft and then working as a master printer. I think I could have made it if I'd really applied myself, but I didn't think there was much of a market for such work outside of Paris and New York. Also, by then I was already in my 30s and my desk job career was starting to take off. I think the last time I was in a darkroom was 1994. Now, some 16 years later I'm still chained to my desk, and unlike Edith Piaf, Je regrette quelque chose. Thanks Mike and Peter, for this excellent portrait of Voja Mitrovic and his dying craft. Thank You Peter and Mike. What a inspiring, honest, deep story. Rare in days when most stories are written in marketing departments. Even though I never printed a single print by myself I enjoyed every bit of it. Being from Macedonia, a country that was part of former Yugoslavia, this touching homage makes an even deeper impression on me. Hope some day to own one of Voja's prints to the point that I don't care about the image as long as printed by him. Voja is a true artist with considerable talent. Talent is something you are born with no amount of how-to's or instruction with give you "talent". If you are one of the lucky ones that are born with it, some skilled teachings will allow you to develop and rise to levels we mere mortals can only dream of. In my days I have meet some really good printers, but less than 5 who I would consider as gifted as Voja. I can only echo all of the above. I cant quite put my finger on what it is that makes the article so moving,close to emotional, the passing of something of such value maybe. Apart from making photos and printing them since 1964, black and white, I also have a boat. I and everyone else used to navigate without any electronic goodies, dead reconing, compass, log etc and a carefull study of the tide streams etc. Making a landfall only half a mile off after crossing the Bay of Biscay felt like magic, today we nearly all use GPS and can find that landfall buoy in the fog, at night! The collective skills are fast dissapearing in all sorts of disciplines. Peters article should spur us on to work a lot harder at our digital negs.It certainly will do that for me. Many thanks to Peter, and to Mike for providing the'platform'. Great stuff. thank you Peter and Mike! After reading this, all I can say is "Thank God everything is still right in the world of Photography". "It just won´t mean the same in thirty years time when we read perhaps on TOP "the untold story of one of the greatest digital printing technicians," and how someone witnessed how he was able to spend at least an hour making adjustment layers burning and dodging a print." I know nothing of printing, so unfortunately I cannot add to that area of discussion. However, I would like to know if Voja has attempted to produce/print any digital files with Lightroom or Aperture? Black and Whites are my favorite. Your eyes see the light which is the true subject of a photograph. I have been studying differing techniques over the last year and prefer Lightroom3 over any other way (so far). It would be curious to me to know how Voja would prefer to process a digital file. Prefer is the wrong word here, but my meaning is clear. There's not much more to add to the comments other than to say 'thanks' to Peter and Mike for bringing this enlightening, touching essay to us. Wow. It's always wonderful to see someone like Mr. Mitrovic operating at his craft. Great story and excellent writing! Can't wait to see the upcoming print offer. For those of us on the West Coast- Henri Cartier-Bresson The Modern Century, will show at the San Francisco Museum of Modern Art from Oct. 30th, 2010 to Nov. 11th, 2011. Great story. I love the dedication and passion for his work and art. I would love to take a workshop from Peter. Thank you for sharing a wonderful relationship and for this rare glimpse of a great character and a gifted and dedicated artisan. I'm not sure why darkroom tales fascinate and please me as much as they do. In some cases, I think I enjoy the story of the printing process more than I do the photographs. I suppose it's possible that it's the telling that I really enjoy. This is well done Peter,a rare insight into the real world of photography,no school can match this "course" in life. This (part 1, too) is just a great read on so many levels. Thank you for this inspiring story. I´m all digital as a photographer, but this makes me want to dive deep into the world of shooting analoge and in the dark room. Thanks. It has been many years since we have even had a dark room. Brought back memories of how you use to be able to manipulate film and then on to platemaking. Artistry it was. Thanks for the article. Can we have a part 3 perhaps in the near future? Thanks Peter for sharing the story of Voja Mitrovic to all of us. It was an absolute delight to take a trip down memory lane of darkroom printing. Those of us who have done darkroom printing know what a gifted artisan is Mr. Voja is. With the advent of digital printing and digital photo papers getting better by the day, I suppose we will have artisans like Voja doing the same for future photographers in the digital realm. I was especially touched by the personal connection you have with Mr Voja. You are an extremely lucky person to know him personally and I find myself lucky to know you and hear the story. It makes me appreciate the art of Photography further. Unlike a painting or a sculpture, a Photograph is ultimately about the story of the photograph than the Photographer. As there are several gifted artist involved in making a photograph great! Hopefully in the near future I will take your Paris workshop and have the privilege to meet Mr. Voja personally. I was moved with delight and inspiration by your article on Voja. Thanks for taking the time to craft a well-written piece. It would be a great honour to meet and discuss all manner of things with him. May he be granted many more years and all joy!